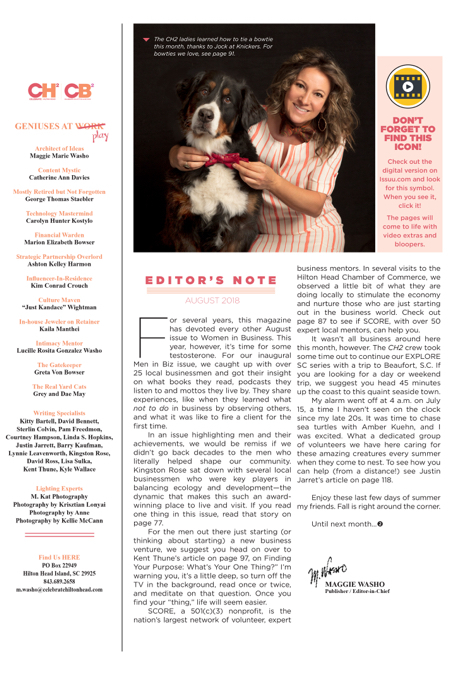 For several years, this magazine has devoted every other August issue to Women in Business. This year, however, it’s time for some testosterone. For our inaugural Men in Biz issue, we caught up with over 25 local businessmen and got their insight on what books they read, podcasts they listen to and mottos they live by. They share experiences, like when they learned what not to do in business by observing others, and what it was like to fire a client for the first time. In an issue highlighting men and their achievements, we would be remiss if we didn’t go back decades to the men who literally helped shape our community. Kingston Rose sat down with several local businessmen who were key players in balancing ecology and development—the dynamic that makes this such an award-winning place to live and visit. If you read one thing in this issue, read that story on page 77. For the men out there just starting (or thinking about starting) a new business venture, we suggest you head on over to Kent Thune’s article on page 97, on Finding Your Purpose: What’s Your One Thing?” I’m warning you, it’s a little deep, so turn off the TV in the background, read once or twice, and meditate on that question. Once you find your “thing,” life will seem easier. SCORE, a 501©(3) nonprofit, is the nation’s largest network of volunteer, expert business mentors. 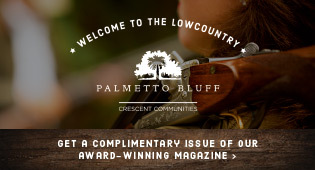 In several visits to the Hilton Head Chamber of Commerce, we observed a little bit of what they are doing locally to stimulate the economy and nurture those who are just starting out in the business world. Check out page 87 to see if SCORE, with over 50 expert local mentors, can help you. It wasn’t all business around here this month, however. The CH2 crew took some time out to continue our EXPLORE SC series with a trip to Beaufort, S.C. If you are looking for a day or weekend trip, we suggest you head 45 minutes up the coast to this quaint seaside town. My alarm went off at 4 a.m. on July 15, a time I haven’t seen on the clock since my late 20s. It was time to chase sea turtles with Amber Kuehn, and I was excited. What a dedicated group of volunteers we have here caring for these amazing creatures every summer when they come to nest. To see how you can help (from a distance!) see Justin Jarret’s article on page 118. Enjoy these last few days of summer my friends. Fall is right around the corner. St. Patrick’s Day in the Lowcountry!